Beginning to spread a little Holiday ‘Pure’ joy with this challenge. It’s hard to believe it’s that time of year, but after saying goodbye to our French exchange student and putting our Thanksgiving festivities behind us, my family was ready to kick off the Holiday season with our favorite tradition, cutting down the Christmas Tree. We typically don’t get our tree until the first weekend in December, but the snow was falling and we were craving some family time with the just the four of us, so we headed to Treetop Acres Farm in Lockport. 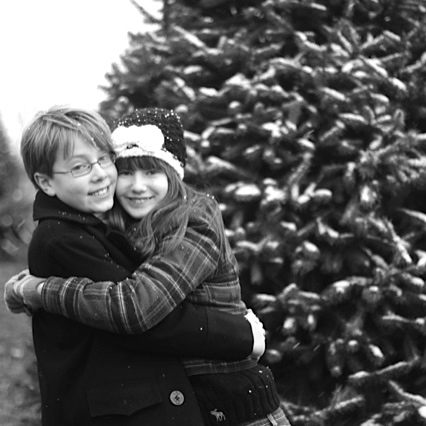 As always, the kids had so much fun running around searching for the perfect tree. Or, maybe it’s running around searching for the ‘not so’ perfect tree? None-the-less, it is always a fabulous time with two very excited kids and their Dad, with a sled and saw in hand. I’m typically a step or two behind, enjoying the moment and taking advantage of the photo opportunities. This shot was taken at about 3:00 pm and it was very overcast with snow. AND, I cheated a bit today. I actually shot this with my DSLR with a fifty lens, and then did the full edit in Snapseed on my iphone. I cropped to a square, brightened a tad, and changed to a neutral black and white. I love the snow on the trees and the tops of their clothing. I love the fact that they actually agreed on a tree! ‘Pure’ joy! I was initially stumped when it came to ‘pure’. But then it occurred to me that I could try and capture a moment of pure joy. 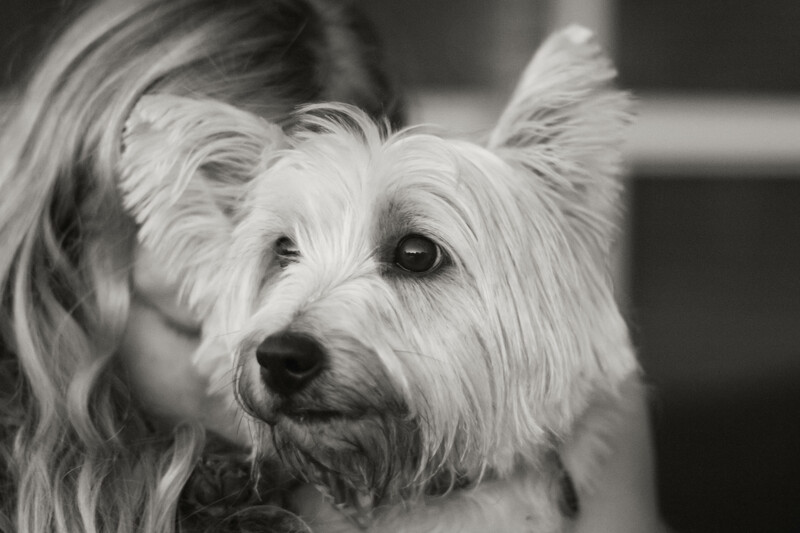 What could represent this better than a 15 year old owner reunited with her beloved pup? The dogs came home from their own little vacation in kennels today and we were so happy to see them. Gimli is Ella’s cairn terrier, from a family of Lord of the Rings named cairns. His dad is called Frodo. Ella is a passionate LOTR fan who spent the summer of 4th grade reading the book, so Gimli seemed like the perfect name for a small, hairy being, just like Tolkein’s famous dwarf. And yes… we are all extremely excited for the new Hobbit movie to come out! This picture was taken at about 5:30 in the afternoon in the backyard, as the sun was setting behind the house, so although it was getting dark quickly the light was beautifully even and soft. ISO 2000, shutter speed 1/80, and aperture f/1.4, which together let it as much light as possible, but also blurred the background. In Lightroom, I converted the picture to black and white, and also cropped it a little so that Gimli’s nose was on a third. I increased the contrast, clarity, sharpening, and luminance. Finally, I used a preset brushstroke from Pretty Presets for Lightroom, that gives a gradual warm haze, lending the image a slightly creamy, sepia look.